The perfect gift for new hires! This Non-Woven ID Promotional Lunch Cooler Bag features an ID pocket on the top, making it ideal for the breakroom fridge! Be ready to tailgate anywhere with a custom imprinted cooler bag. Put some promotional punch in lunch with these custom lunch bags with a Velcro closure and ID card pocket. A unique brown paper lunch-bag style custom lunch bag but more durable and made of laminated polypro materials. A polyester promotional cooler bag that holds your lunch or up to 6 cans of your favorite beverages while showcasing your logo. Durable and large! This Jumbo Custom Lunch Cooler Bag has a 20-can capacity, making it the perfect size no matter how hungry you are. A convenient light weight, non-insulated custom lunch tote with fold over top is perfect for those lunches that are not required to maintain their temperature. This custom lunch bag is a great way to show off your logo everyday at lunch time. Pack your lunch for work or school in these stylish heather canvas custom cooler bags to make your brand stand apart from the competition. A military style logo cooler bag holds your lunch or up to 6 cans of your favorite beverages while showcasing your logo. 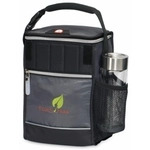 Logo lunch cooler tote style cooler with metal grommet and web handle. A custom lunch bag that is idea for a Big Time appetite. This Heather Custom Lunch Cooler Bag is insulated to keep your food the perfect temperature until lunch time! The large imprint area makes this lunch bag a moving billboard for your brand. A foam insulated, reusable Promotional cooler bag that beats out the regular disposable paper and plastic bags. These customized lunch bags are built with an easy top loading design for your convenience. These non-woven customized lunch bags are budget friendly and give your logo plenty of room to shine! This logo tote not only keeps your good fresh but features a quilted diamon accents as well. Custom cooler bags are a more Eco-friendly way to carry your lunches to school or work. Stand out in the break room with this 6 can capacity Metallic Non-Woven Custom Lunch Cooler! It features a heat sealed PEVA lining to keep food chilled for hours. Made of premium quality non-woven Polypropylene, this Mini Insulated Custom Zippered Tote is ideal for everyday use. Perfect for snacks or lunch! With its insulation feature, it keeps food fresh and cool. Stay ahead of your competition when it comes to trendy promotional products and give these new denim and neoprene custom lunch totes imprinted with your logo so yous recipients can pack their lunch with flair and pizzazz. Brown bag it in style with this Avalanche custom cooler bag by Igloo. A lunchroom favorite, the Koozie ® logo Lunch Sack is insulated to keep your food colder for longer. This Sierra burlap custom lunch tote features a unique design that will give instant attention to your brand every time your recipient takes their lunch to work or school. Promotional cooler bags are an inexpensive and practical promo giveaway item that recipients will love to use. Given the dearth of interesting options out there, selecting one of ePromos customizable insulated cooler bags is a great option if you're looking for a useful and original logoed giveaway or promotional item. It might be hard to pick the best lunch cooler from our wide selection, but there's sure to be something for your target audience. Not only is a lunch sack an excellent option because of its usefulness, it's also much more environmentally friendly than constantly using and tossing brown paper bags. In fact, ePromos even has environmentally friendly promotional cooler bags made of recycled materials for the seriously green consumer. ePromos has lunch carriers in nearly every shape, size and material. We have neutral colored sacks and brightly colored logo bags available in nearly any color. We also have plenty of fun patterned lunch coolers. With such a wide range of insulated cooler bags to choose from, you can easily find lunch bags suitable for anyone from young kids (so everyone has the same special lunch bag on the field trip) all the way to executives (ensuring everyone knows who pays them well enough that they can pull caviar out of their lunch). Furthermore, beyond shape, size and material, ePromos also offers promotional cooler bags that are ideal for any type of lunch. We have the best cooler lunch bag to keep your turkey or tuna fish sandwich chilled and fresh. Alternately, we offer insulated lunch bags perfect for hot food so the cheese on your panini will still be gooey when noon rolls around.